Let’s set the scene: It’s the third session of the Copenhagen Beer Festival in Boston, a festival that features a number of the top breweries from around the world. Despite all the notoriety, it’s the smallest name there that has stolen the show. At the front of an endless line that lasted all three sessions stands Raf Souvereyns, smiling and conversing with festival goers as he pours one of the 20-plus (yes 2-0) blends he brought to share. It’s been three years since Raf first began blending lambic under the name Bokkereyder in Belgium. What started as an interest in the mystery of spontaneous fermentation and extended barrel aging, led to picking cherries with his friend to create their own sour cherry lambic, and has slowly turned Raf into one of the most beloved names in lambic today. While Belgium has become known as the mecca for lambic, home to some of the most renowned breweries with long traditional histories including Brasserie Cantillon and Drie Fonteinen, Bokkereyder is quickly making a name for itself. With a capacity of about 80 oak barrels today, the one man show that is Bokkereyder has remained a mystery to many that aren’t engrained in the lambic scene. One of our favorite blends is Druiven, which uses Dornfelder grapes, harvested from a winery by the name of Hoenshof, just 20 minutes from Raf’s blendery. The beer pours a deep crimson color, almost like a thick puree with a medium white head. The nose gives off a musty grape wine aroma that is complemented by an in-your-face amount of barnyard funk. 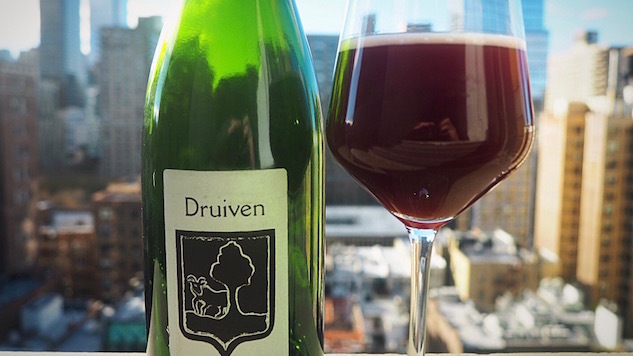 For Druiven, Raf wanted to give the beer more structure, so instead of using just the Dornfelder grapes, he blended in lambic that was made with Pinot Noir and Regent grapes. The mouthfeel is bubbly upfront, followed by a subtle fruitiness. To be honest, if you were to drink this beer blind, it would be hard to tell whether there were grapes or cherries added. As the beer warms, that original delicateness of the fruit-flavor begins to take center stage of this complex masterpiece. The mouthfeel develops an almost earthy wine-like quality. This, however, is not surprising, as Raf tends to use techniques he’s learned from winemakers when blending his grape lambic, first fermenting the beer on grapes and then aging it in oak barrels. Following the earthy-funk, you get that tannin quality, common in many red wines-a drying sensation throughout the mouthfeel. This is due to the Pinot and Regent Grapes, which are both known to be quite tannic. It finishes with a crisp tartness, capping off the final dimension. While Raf’s blends have been receiving rave reviews from those that have had the pleasure of trying them, it’s the stories behind these blends that truly make Bokkereyder. Whether it’s using peaches he noticed outside his neighbor’s garden, or the time he and a friend hand-picked over 40,000 Schaarbeekse cherries in a few days to develop Pinot Kriek, Raf’s beers taste better once you know how they came about. For those of you that might be asking yourself “where can I get this,” rest assured, Raf is trying to provide that answer ASAP. While many of his blends are available in Copenhagen and Stockholm, as well as several festivals, he is currently working on a distribution plan for the U.S. Make sure you keep an eye out, because these beers are not something you want to miss.